We bought our home, a 1904 stucco American Foursquare, in November 1997. The following spring we decided to build a pine and epoxy fence in the backyard. 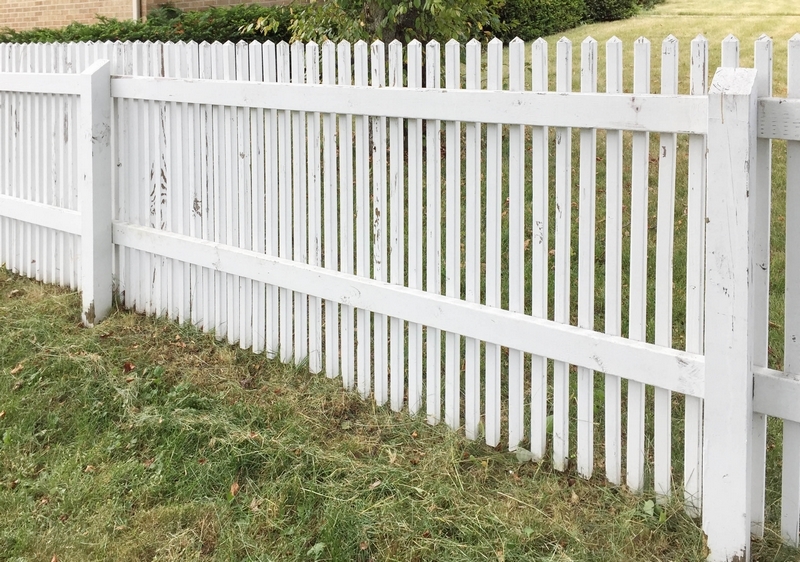 White PVC picket fences were all the rage in the late 1990s, and while we liked the clean, bright, classic style of a traditional looking fence and felt that was in keeping with the style of our home, we observed that PVC fences tended to blow over in high winds. Considering Michigan’s frequently rough weather, we knew we wanted something sturdier. We decided a custom wooden picket fence would fit the bill. This was easy enough to design with classic 2″x2″ pickets set one picket-width apart. We incorporated some ideas to make the fence longer lasting: cutting the tops of the pickets to pyramid points to discourage kids from climbing over it or sitting on it as well as to prevent the pickets from collecting/absorbing snow and rain; and most importantly, pre-treating certain parts of the fence with coatings of WEST SYSTEM Epoxy. The posts, as the most important and hardest to replace structural components, were fully encapsulated with epoxy. We leaned the posts upright against sawhorses and coated them about halfway down with a couple of coats of 105 Resin/206 Slow Hardener, waiting until one coat had reached the tacky “green” stage before adding the next. Once these coats of epoxy cured, we flipped the posts over and coated the remaining halves. We epoxy coated the end grain of the 2″x4″ stringers and 10″ to 12″ inside the end of each stringer. Each picket was coated on the bottom and about 6″ up. All of this was also done before assembly, again using sawhorses. Because it would have been both time-consuming and expensive, we elected not to fully encapsulate the stringers and pickets with epoxy. We simply cut a few extra pine pickets to have on hand in the event that any got damaged. As a matter of practicality, the investment in epoxy and the labor of fully coating each fence component seemed like overkill. 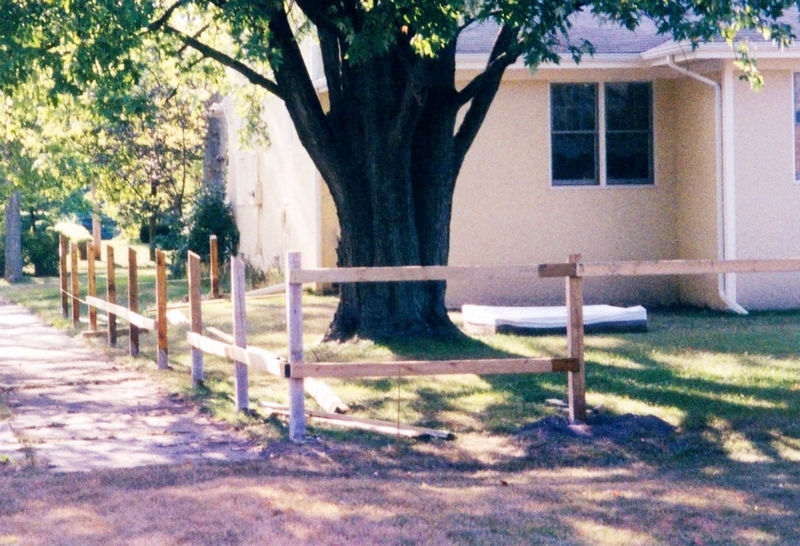 The epoxy-encapsulated fence posts were set in concrete and tied together with stringers. 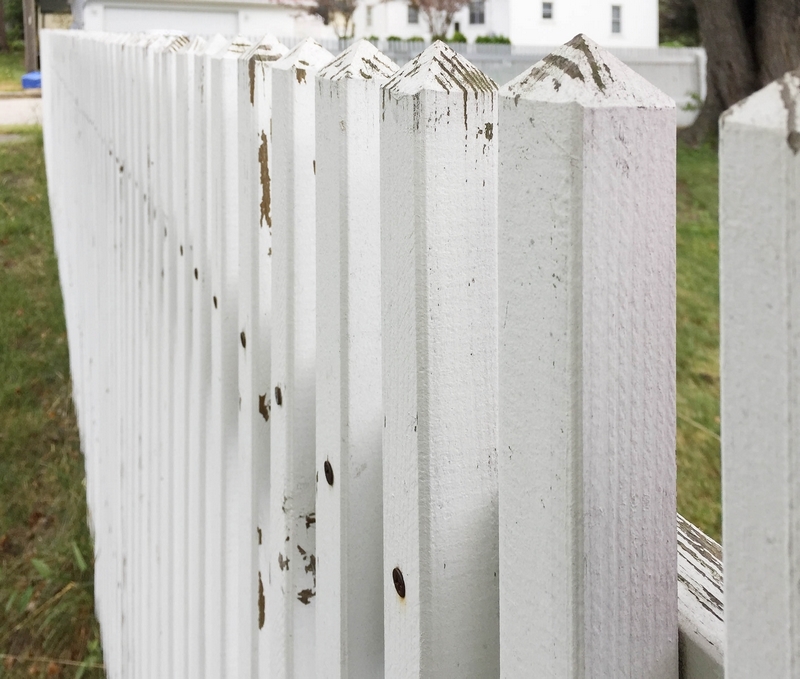 Coating the end grain helps the fence maintain moisture stability, reducing seasonal swelling and shrinking so that it hangs onto its exterior-grade latex paint longer. Prior to erecting the fence, we painted the pickets in assembly-line fashion on sawhorses. This ensured they were each fully coated with paint, and saved us untold hours of the back-aching labor associated with painting an erected fence. The pickets were cut with a pyramid point on top to minimize water absorption. 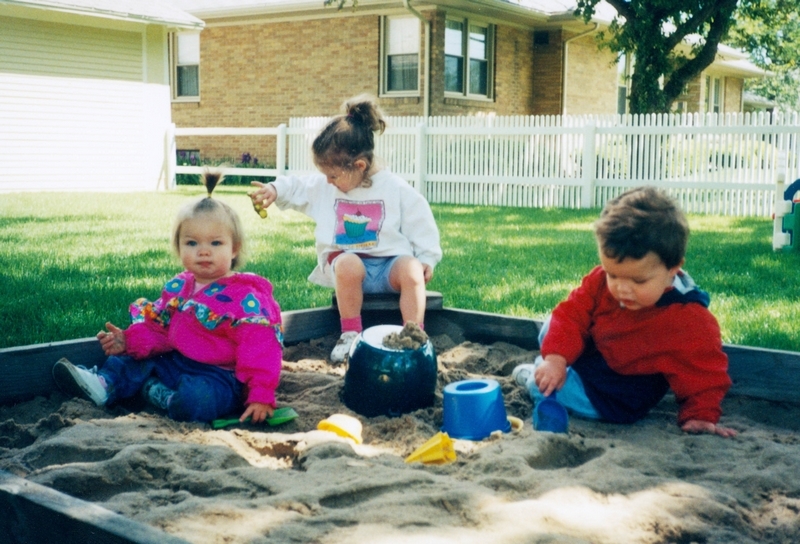 Assembly began with renting a post hole digger, digging the holes, and putting gravel in them for drainage. We then mixed and poured Quikrete® and set each epoxy-encapsulated post in an annulus of concrete. Next, we used a laser level to accurately site the posts, then cut them to the proper height so that the topline of the entire fence would appear even despite variations in grade across our backyard. We always meant to put those fancy copper caps on the post tops, but 20 years later still haven’t gotten around to it. Rather than nails, we used screws to attach the stringers to the posts, then painted the posts and stringers before screwing the painted pickets into place. While they are a little more work to install, screws are much more effective fasteners than nails for holding a fence together long-term. It was easy enough to get perfect picket-width spacing by using, you guessed it, a picket. 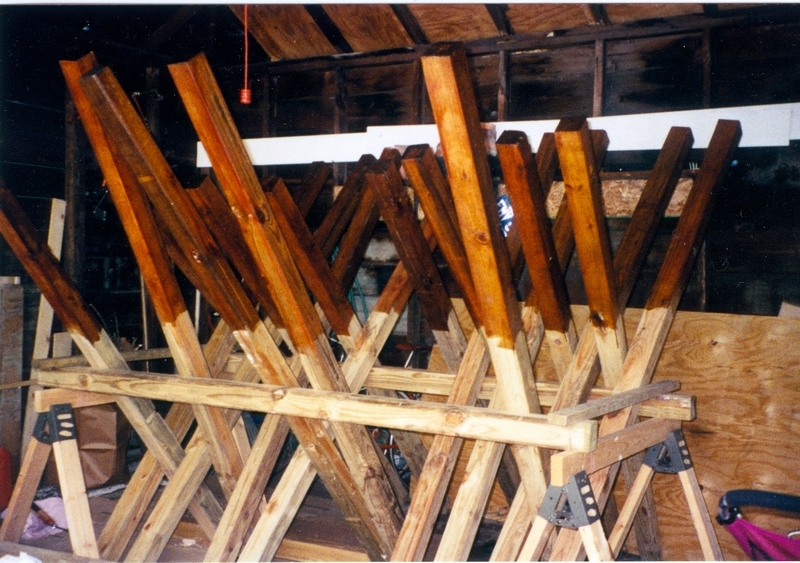 The epoxy fence approaching completion in 1998. When we first installed the fence we were often asked if it was PVC. And while it’s not quite that perfect looking anymore, our pine and epoxy fence has held up beautifully for the last two decades and has never been repainted. It has withstood rambunctious kids, dogs, countless fox squirrels, and blizzards. Most of the spare pickets we cut remain in limbo in the rafters of our garage, with only a couple pressed into service over the years. While our 20-year-old the epoxy fence is admittedly in need of repainting now, it’s every bit as sturdy as the day we finished it. A picture taken in summer 2018. After 20 years, our pine and epoxy fence it’s due for a fresh coat of paint.